High Quality Content by WIKIPEDIA articles! 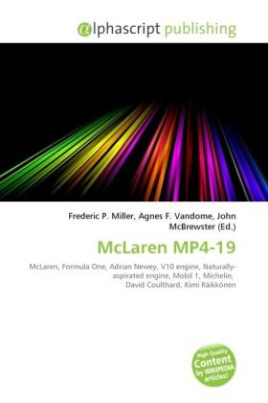 The McLaren MP4-19 is a Formula One racing car that was built by McLaren. It was designed by Adrian Newey, and introduced at the beginning of the 2004 Formula One season. It was described as a "debugged version of the McLaren MP4-18." It was not a successful car, and the team suffered various problems concerning reliability at the beginning of the season. A new car was required by mid-season. The MP4-19B was basically an all new car with a radically redesigned aerodynamic package. The fact that Coulthard qualified third for its first race, the French Grand Prix, gave the team hope of a better end to the season. This was realised when Räikkönen won the 2004 Belgian Grand Prix ahead of the seemingly unstoppable Ferrari F2004 of Michael Schumacher, who won 13 of the 18 races that year, currently the record for most wins in a single season.